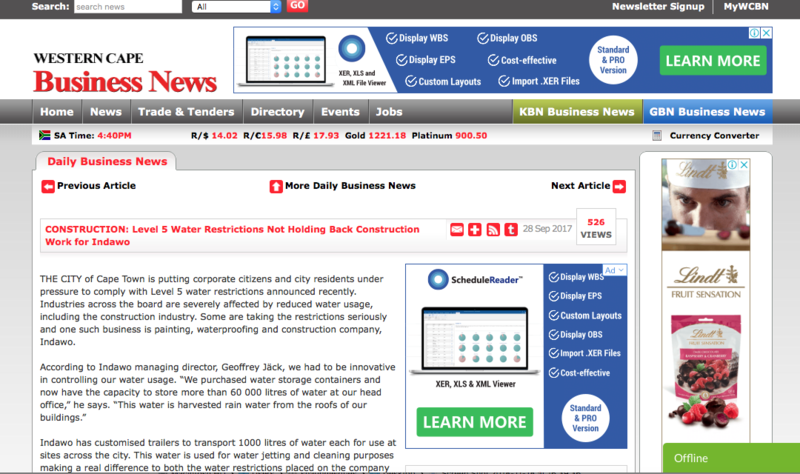 Level 5 Water Restrictions – So, the City of Cape Town is putting corporate citizens and city residents under pressure to comply with Level 5 water restrictions announced recently. Industries across the board are severely affected by reduced water usage, including the construction industry. Some are taking the restrictions seriously and one such business is painting, waterproofing and construction company, Indawo. Indawo has customised trailers to transport 1000 litres of water each for use at sites across the city. This water is used for water jetting and cleaning purposes making a real difference to both the level 5 water restrictions placed on the company and to maintain operations. The ultimate positive results of this initiative are far-reaching. Indawo can keep its workforce busy and building owners, bodies corporate and residential complexes can continue with projects despite the restrictions and without concerns of using water from their main water supply. Most importantly, Indawo can contribute to the saving of water while continuing operations and maintaining productivity. So, by collecting rain water for usage on sites, Indawo can assist clients with their projects during times of tough Level 5 water restrictions. This in a small way keeps the economy running. The challenge is for all business to think creatively to save or harvest water.